These auto youtube/google videos crack me up, it is probably the music . he was working on the lathe with a non chip cutting lathe bit, so it’ll often spiral out the cut and attack the operator, i was trying to catch an example on video. this is a test pulley we’re cutting to test out the process. we ended up with a bunch of these swarf aluminium tumbleweeds. Making the top surface nice and flat, and with a HF mini lathe , that is some fun. we wanted a straight hole into the pulley for an allen screw into the keyway on the motor shaft. I used a V bottomed tap guide and a centre punch to make a pilot mark for the drill press. To make sure i had a straight hole. I used a digital angle gauge with a magnet bass, attached it to the top surface of the tap guide, then put the tap guide onto the drill bit while mounted into the drill press, then zeroing out the gauge. next mounted the the pulley+vice to the drill, put the tap guide + angle gauge onto the top and rotated it til it was back to zero. This way the hole was being drilled from the reference of the drill itself , not the table etc. and it worked, probably overkill but circles are hard. also grabbed a 4x x 4 1/2" by 1 1/2" 6061 block to mill into another pulley..
for the head spacer, the 4x3x6" block needed cut down a little, so slap it on the horizontal bandsaw. note to self(others) set the tension first and make sure when you think, hey isn’t it taking a really long time to cut that the top isn’t sitting on top of the block. this block is 4×6" which is the size of the cutting area, but you can’t cut this size horizontally longer, has to stand up like this. I would have cut it on the bandsaw which i put a much better blade on, but we wanted the little machine to make it all the way though, unfortunately at the very end the block loosened and cut off a tad more at the bottom than we wanted. This made the facing operation an overall 0.013" cut instead, which ended up working out really well in the end. This step is making the soft jaws parallel with each other and more importantly the machine ,the idea being that this surface will be as parallel to the cutting surface as is possible with the current setup, then we’ll put the head spacer on it and face it, flip it and do a face pass on the other side. targeting a depth of about 2.5"
We replaced the vice jaws with soft jaws and cut a grove in each side using an offcut 1" block of tool plate as the side references. 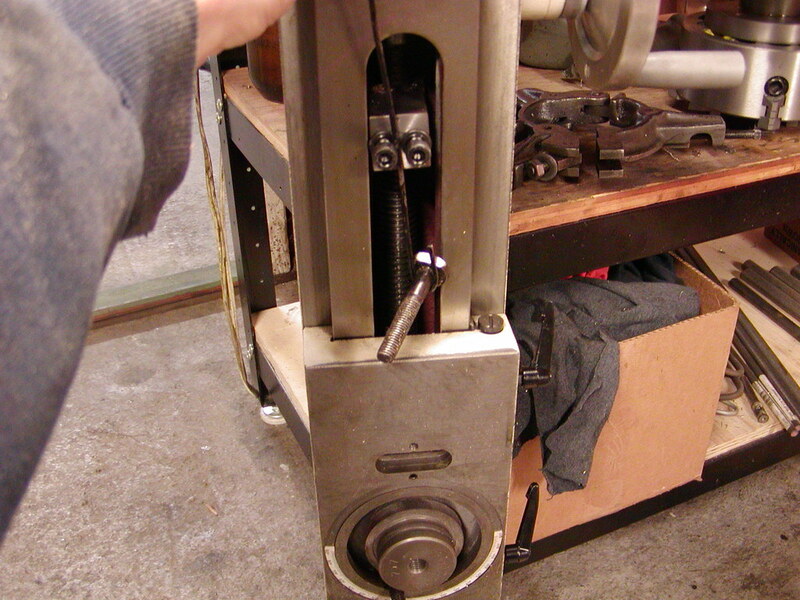 facing the upper head spacer. cutting off about 0.002" each pass. after the facing operation, on to the fly cutter. we were 0.1" off on the width which was a damn shame, since it meant having to move the y 0.3" then pass back and forth. This is a single point cutting tool from the lathe that makes a very nice surface finish. this isn’t for looks, we need this block to be as parallel to the front/back as possible. Any deviance will show up later when its installed on the mill and it’ll affect out our ability to cut. before the fly cutter is run you can see the surface finish is pretty good and there is that low spot i mentioned earlier after the horizontal bandsaw it is a small defect and won’t affect the overall stability of the block, we’d rather have the girth since more Y axis movement. that was it so far, next is to cut one hole in the middle, counter sink it to fit onto the machine and drill 3 holes for the M10 bolts. this is the bolt pattern we’re following. after measuring the corners and middle it came out to 2.54" within the tolerance of the calipers, so pretty good. you can make a 10 5×2 idc ribbon cable to extend the control box. the power cable, i used a dryer cable as its called here at lowes, its a NEMA 13-30P which can do single phase 220V + 125V since washer/dryers often use both. We will just be using the two 220V hots + earth/ground, no neutral. Totally overkill but the idea was to have an outlet for a welder, which didn’t work out since the sparks installed the wrong cable, but plenty for the vfd+motor and the breakers are set to the wire size. these are the stocks for the side mounts, ready to mill. that was about as far as we got for this day. my line laser arrived as well, this is for a scanner project. I picked up a 1HP 56C ironhorse from automation direct motor and a 2HP VFD , the 1.5HP was out of stock, and i accidentally ordered the 2HP motor but changed it before they shipped, I should have kept it, but i’d rather swap out the general purpose motor to a inverter duty motor later. These pop up on ebay often so i’m looking out for the killer deal . The inverter duty is generally 3-4x the cost. Here it is mounted to the motor (the left side i’ll cut off later) those are 3/8" 16 1"inch socket cap bolts. i used this motor in my modelling https://grabcad.com/library/stainless-tenv-motor-56c-1 its a different motor but the base is right. The we face milled a couple of long pieces, these will go along the side of the head and the motor plate will bolt on to it. Likely will use a 2.2inch and a 1.2 inch pulley to give a 1.86 ratio. this all i had time for this Sunday night. more next week. This is the have at it and see what happens. and that is what happens with a 0.2HP motor and possibly uncoated endmills. so now we’re looking into a VFD+56C frame motor around 1HP and 29 lbs of weight to put on the head. Once you add a lot more weight to the head you’ll need a counterbalance, springs etc to help it lift back up. the part was made to test out 2.5D/3D milling where the Z is moving up and down during a cut as well as the X/Y, turned out decent when we altered the cutting depth so it wouldn’t bog the motor down. Interestingly A.D. say that this VFD isn’t the best choice to drive a mill because of the low speed settings it’ll drop power significantly, but a lot of people use them. The part eventually came out decent. I just made a bunch of shapes in Fusion360 and went with it. The object is the top of the Z axis column. Finally started the Z install. Removed the flashcut motor mount, and the removed the two retaining nuts at the top, one jam. they come off easily. the collet tool i use on my CBeam machine fits perfectly. 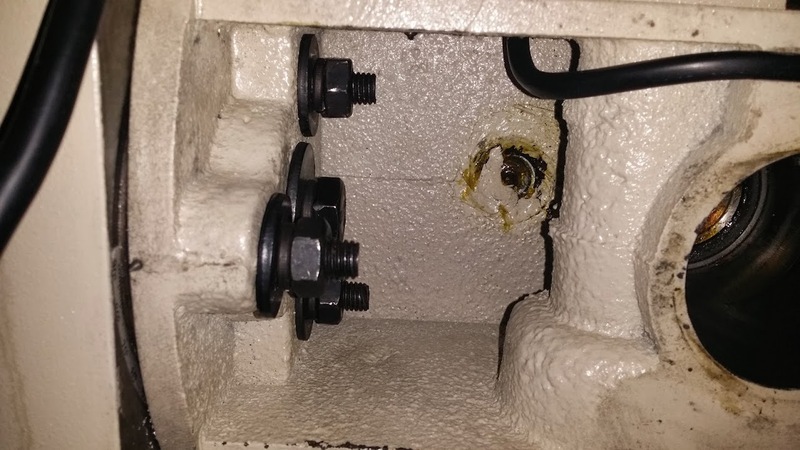 the two bolts in the middle there are what connect to the Z axis platform and the lead screw. 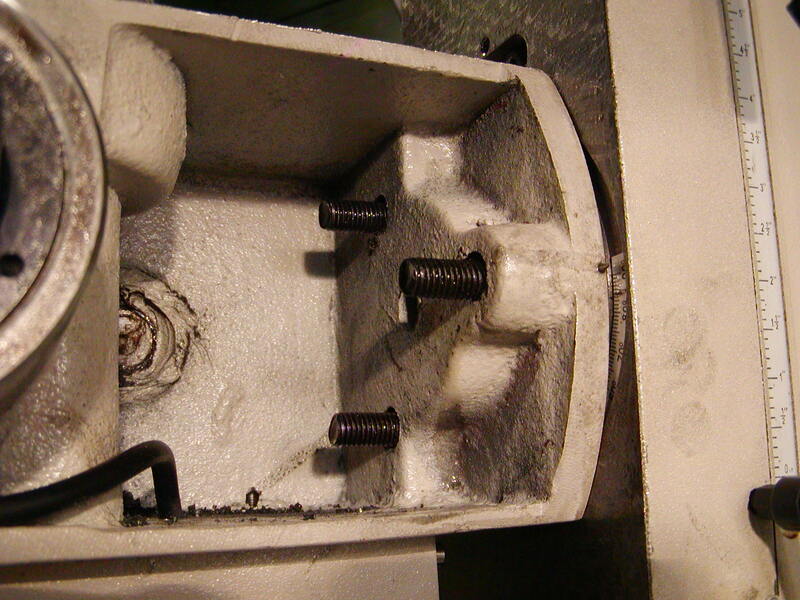 remove these, loosen the head bolts and the lead screw will just pop out . the mount to the head is a two piece part. so it comes away easily. Removed the manual jog wheel, just a few bolts on the side and it pops out. remove the head , the three outer bolts sit inside a channel, one can fall out into the column , not hard to get it out but take care here. lift the head away then slide the z plate up and off. later one we’ll discover this forward distance is quite important and the mounting bolts in the top plate being off will cause it to bind at the top, so we ended up superglueing a couple of small belleville washers to the front of this to give a small spacer of about 2.7mm, since we can then change the gap with the pressure on the bellevilles it means we can test it later and let the machine pick where it wants to be, before bolting it all down. top plate mounted (with only one M8 bolt), than ran it up and down a few times to let the ballscrew settle into place with no binding. we didn’t have a pulley for the ballscrew z, and the old one had center hole too large so onto the lathe to make a brass insert with two holes for the allens to go through. didn’t get photos of that operation though. 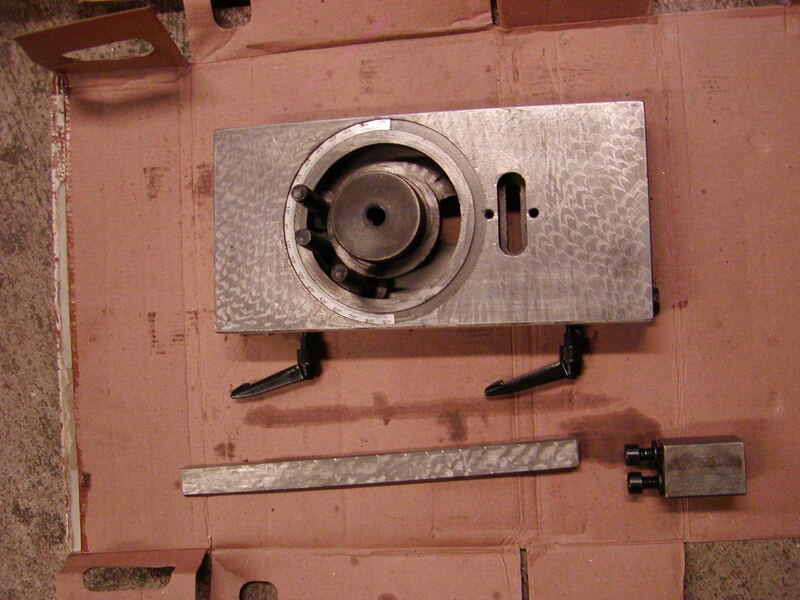 ended up ordering some off ebay, that had flanges and about the same build quality as our drill press version. back together and leveling out the table, manged to install it with .0001" off! but of course when we tightened the bolts down it moved as expected, so tram with a mallet time..
testing the backlash, tested out to .009" on the first go, which is when we had to go back , find the binding, realise the mount holes were so far off , mark them out and then remount it all with only one bolt, so have to recad that Z plate mount and plate again. So for each mount i’d check the machine first, or use slots in the mount. we didn’t preload the double nuts with bellevilles on the Z so the backlash is higher than we’d like, but still much better than it was. Having the max speed go from 15IPM to 100IPM is worth it. i have the china/ebay quick tool changer things in ER20A with collets that were about 1.99$ each ! the holders are decent, the collets are OK but since they cost just about the worth of the metal, i’ll upgrade them as we go along. the holders and collets arrived in a few days. unfortunately i had to run off to ER as we were about to cut since my gpa was admitted again (he’s ok). but mmca managed to cad up a 2.5/3d cut cone to test the new Z axis. Made the top plate of the Z axis mount, and face milled off the rest of the Z mount. Don’t CNC during halloween, here is mr pika running a facing operation. i was running the fog machine outside, the garage filled up. I bandsawed the outside of the top plate, using a piece of metal as a guide, that metal wasn’t straight so i miscut the left side.. on otherwise a nice part, we did break one drill bit because the stock was slightly deeper and disagreed about readjusting the Z 0.0 adding on the difference etc, instead of just redoing the CAM, the answer was of course redo the CAM since the retracting was a fast partial retract so it clipped the edge of the hole and snapped. You can see it on the inner circle of holes middle left,. shame since the part had a mirror finish on the mating side after a face mill. but its all luckily cosmetic and the idea here is to build parts that are better than the existing ones, then redo it all again. There are three 31mm bearings inside the centre hole. it’d mounted nicely to the ballscrew with an interference fit after very slightly knocking it down with some 1000 grit. We’re ready to mount the part now and see if it all fits. here’s the A360 of the latest model http://a360.co/1GdnYAf this is the Z plate and mount. We need stronger belleville washers, so didn’t get to fit it up, should be next week. After that we may move on to a motor update or extend the Y axis, the current motor is only good for about 0.2HP/149N/m.s which is pitiful. Looking at a 220VFD with a 56C frame motor. The Y axis is longer ballscrew, put the stepper on the back of the machine, add a two inch block between the table and column, and a 2" , 5" diameter round stock on the head. So since i added the 30 gallon noisy-ish compressor a few days ago, i thought to myself i’ll just install it next to the CNC for the moment since that is the noisy/messy corner. When installing it , i put it on the same circuit as the CNC’s motor while thinking, i should remember to move this since if they both run at the same time they’ll pop the 20A fuse.. So of course next day, we start running up the mill, i’m CAD’ing, mmca and mr pika are working the CNC. I go in the house and to grab something and i hear a lot of air, sure enough the fuse has blow, cnc is down, pc is down, compressor is full of air, my pc is also down. . aha right that 20A circuit, after resetting the breaker and moving the compressor to a different circuit, and making a mental note to add UPS’s all over and separate all the PCs ( and cable modem/routers) to a different circuit. We were off again. So we’re cutting away and of course this machine is a new build, so its prone to things going wrong and we’re usually watching it while it cuts. Since until now we’ve been using canned air as we are ecologically friendly, imagine when a fairly large compressor kicks on about a half a metre away from you, heart attack time which isn’t good since both my grandpa (wife’s side) and my brother (my side) are in hospital for quad bypasses and other heart issues. So I figure after the part is done, i’ll relocate the compressor out side for it. I had some old wood lying around from shelves that were in the garage before we moved in. So i built a hobo shed for the compressor, ran some 300 psi tubing for it and mounted it. I’ll change it out to black pipe when I’ve got it settled as to where it will all go. Hobo shed, sawzall, scrap wood and some screws.Even though I’ve got some nice wood working tools I used all the crappy ones. 5 minutes later. I’m sure the neighbours regret buying that rooster last week. mounted the dirt filter/moisture trap inside the garage with a quick connect. great, that’ll work for now and hopefully no more WTF what was that when we’re doing delicate machining etc. I should know better since when i first started air brushing i used a noisy compressor, and while i was painting it’d clatter to a start usually making me jump and paint stuff that wasn’t meant to be so, learnt that lesson and bought a supersilent 20A for that many years ago. Compressors are usually fine outside even in the heat, the motor and compressed air is a lot higher temperature than most ambient temps anyway. I left gaps in the front and back for airflow and i’m not permanently running it, just when i need it. que horror stories from some , and others with the I’ve had my compressor under my bed for 100 years with the wife , four cats and a subway franchise and its always been fine. It is oil based too. Milled out the top part of the Z column this plate goes on the top and holes the bearings for the Z ball screw. Created and CAM’d it in Fusion360. http://a360.co/1GdnYAf Design is there, though be warned haven’t test fitted it yet. Took about an hour to cut out of 7075-T6 aluminium with two drill bits 1/4" and 1/2" end mills. Bought the bearings from alibaba they were nicer than local sourced , claimed ABEC5 rated. The last ones we got had laser marks showing the high spots, but who knows. We’re using two bearings at the top + a spacer, the spacer is the outer race of another bearing, yep we use bearing races instead of precsion washers/shims. Getting close to adding some sort of collection tray/enclosure. Also finally picked up a compressor so no more canned air , added an electronic solenoid + SSR to allow it to be controlled from the master control box. Used this solenoid control which is 110V. cad’d up the top plate that holds the bearings too, that is in the file linked above in A360. Next steps are to cut that out, run a boring bar over the bearing hole in this adapter and i guess we’ll try to fit it.